I have seen nearly every bee in our care today, probably 200,000 or so, and it has quite literally made my head all buzzy. Thank goodness I am not a commercial beekeeper! I even saw bees belonging to the second hive to join our Bee holiday camp as we settled them in at Barsham. They were a little annoyed (not the exact description given by their owner, but much more polite) at the disruption and were really quite loud. As I lifted the travelling screen from the top of the super, the bees on the underside all turned as one towards the same corner and marched. They were buzzing so much they were blurry to look at and the vibration travelling through my arms was quite intense, something I will never forget. Superhive was generally looking good although they were rather cross today, they also looked as though they were starting on their stores – it is time to feed them. Maybe that’s why they were a little grumpy. Meanwhile over at Flixton – Frank Hive has increased it’s stores but is still a small colony, no Queen seen today. Betty Hive only had 2 Queen cells, has increased it’s stores and Bluey was seen. Edith Hive was literally a hive of activity, lovely friendly bees, Queen not seen but lots of eggs present. We also put mouseguards on and Gemma took the feeders for cleaning. We have a few more weeks before we need to decide how to manage the 2 smaller colonies over the winter, as 2 units or 1 amalgamated one. We will hold an Opening Ceremony for the Library Courtyard on Sunday September 19th at Noon, and would be especially pleased to see those connected with the Bungay Society, Town Trust, Town Council, and Three Willows Cafe, as well as individuals who have contributed, or simply the curious – all welcome. Latest development is planting out of fruit trees – thanks to Paul Jackson for his most recent efforts. Anyone wishing to take part in a working party at the library over the weekend of September 11th/12th please email; transitionnick@gmail.com with availability. Two of our Bungay Community Bees members have been – and continue to be – busy researching the relationship between bees and flowers. Initially they are building a picture of plants useful to bees for nectar, pollen and propolis, placing them within the bee year. Next year we hope to publish an actual bee ‘calendar’ encompassing both wild and cultivated plants to enable us to use these plants in our gardens for maximum benefit to bees. Charlotte has written an inspirational piece for the Transition Norwich blog about shifting our consciousness to be aware of the bees and flowers about us, linking in with the ‘transition’ concept of resilience. It can be found at ‘Flowermind’ on 10th August 2010. The wasps are now becoming a problem and we watched guard bees attacking them at the entrance of one of the Flixton hives, it’s time to put the entrance block back underneath the mouseguard on the Barsham Superhive. We now have yet more dilemmas, keeping bees is certainly not a straightforward business. The two Flixton Hives (Frank and Betty?) were our first stop last week on my reluctant return from holiday. Betty Hive had seven Queen cells, all containing eggs or larvae, one of which was sealed. The bees in this hive seem determined to supercede their Queen, but we don’t know why – are they unhappy with her? Or are they just confused? The existing Queen was there, helpfully displaying her blue paint – surely she can’t be condoning all this Queen cell activity? So should we leave well alone and see what they do, or squidge all the Queen cells – knowing we have an egg-laying Queen, or squidge all but one Queen cell just in case they do need a new Queen? In the end we decided to leave everything alone for this week and look again in a weeks’ time. In the meantime both Flixton hives are being fed sugar syrup and Bee Vital to encourage them to build up some stores. After that rather perplexing visit we looked in the ‘Superhive’ at Barsham which is ticking along really well, we even spotted our beautiful Queen and suddenly all my disgruntlement at returning from holiday vanished. We would like to thank Iain Huggins and members of Bungay Town Trust who have pledged a £500 grant towards the project. I published this post on This Low Carbon Life (the Transition Norwich community blog) yesterday (Saturday 31st July). Here it is verbatim. Some weeks ago I met a woman on a bicycle just outside the village of Uggeshall, a few miles from where I live. She was born and raised there, has a garden orchard and sells her apples and jams outside her gate. She told me she remembered the moment when practical jobs and skills started to be looked down on in favour of adminstrative and office work, which was about the time she left school. We were roughly the same age. I am 48. I was born in London, and grew up in High Wycombe on a council estate. My dad was a car mechanic and my mum cleaned offices and worked in shops. My dad also repaired wind instruments as a sideline, and built our kitchen cabinets himself from wooden fruit crates. My maternal uncles, who like my mum had emigrated from Ireland in the 50s, spent their lives laying bricks on building estates in London. I passed my ‘twelve plus’ exams and went to grammar school. The last thing I wanted to do was work with my hands. I didn’t know how to do it and I didn’t want to know. I couldn’t wait to grow up and move back to London, which I did, where I worked in television and then studied for a degree in languages. 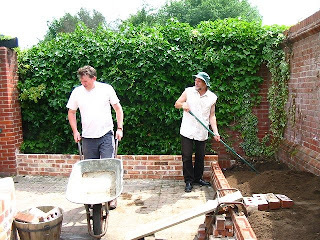 Yesterday, eight of us from Sustainable Bungay turned up to shovel five tons of earth and compost into the new raised beds and borders at the Library Courtyard Garden. I met Paul (‘Coley’) the bricklayer for the first time. You can see his fine work in the photos. In all we were there for about four hours. It was hard, physical work, made lighter by the fact we were doing it together, for something that the library courtyard group, led by Nick, has been planning and working on for over a year now. All the negotiations with the librarians, organising a permaculture weekend, a community consultation, the design meetings, sourcing the bricks, soil, manure, plants and trees and transporting them, finding a willing bricklayer. All this and more with the inevitable delays, frustrations and disappointments – WOULD THIS PROJECT EVER HAPPEN? “Transition is a white, middle-class movement,” is a criticism I hear all the time. But like the famous “We’re all middle class now,” it appears to be saying something when really it acts as a conversation stopper or sends us running off to see how ‘we’ can change how we’re perceived. The fact is whatever class we are from, when we float around with our ‘lofty thoughts’ and opinions and don’t get down to the actual work, others unseen, mostly somewhere else but sometimes in the same house or group, will be picking up the tab. Doing the hard graft, the cleaning, the mining, the building, the paperwork, the phone calls, the communicating, the organising, the donkey work. For Transition to work we all have to pull our weight.